Here's a clean and simple card using a very old, but still loved hedgehog stamp. These cute little critters never fail to bring a smile and you will see them on this site every now and then. 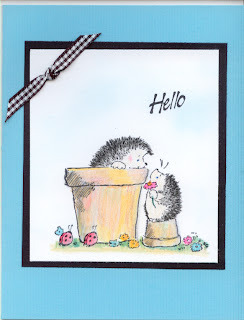 Oh, those hedgies are so sweet. Love your coloring and the little touch of gingham ribbon. :) Ann Y.